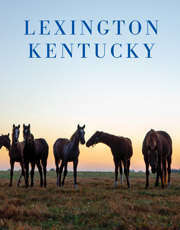 Travel writers and bloggers have no shortage of things to say about Lexington&apos;s Bluegrass Region. 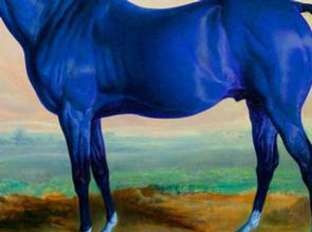 Explore these links to see what intrigues and inspires them about the Horse Capital of the World. Travel + Leisure. Why This Southern City Has One of the Most Exciting Culinary Scenes in the Country. Lexington, Kentucky&apos;s biggest culinary evangelist on how immigrant cuisines are shaping the new face of southern cooking. Lexington is known for many quintessentially Kentucky things. It’s the unofficial capital of Bourbon Country (no small feat in a state that produces 95% of the world’s bourbon), and the self-proclaimed Horse Capital of the World, with an equine population of over 300,000. Amy Laughinghouse. Given my surroundings - a jumble of old warehouses, graffiti murals, a craft beer pub manned by a bearded youth - I could be in one of New York&apos;s trendiest neighborhoods or London&apos;s uber-cool Shoreditch. But as I belly up to a cold steel bar, which crouches low and lean within the cavernous brick-and-concrete box that is Ethereal Brewing, the bartender&apos;s distinctive accent plants me firmly in Dixie. "What are y&apos;all havin&apos;?" he drawls with a smile. Yes, sir, I&apos;m in Lexington, Kentucky, alright. Jackie Hutcherson Parker. Bluegrass, basketball, bourbon, and beer give springtime in Lexington, Ky., a sense of place like no other. Tiny, purplish blooms pop up on redbud trees against acres of rolling bluegrass in central Kentucky. March Madness is like a holiday, especially if the local favorites, the University of Kentucky Wildcats, are playing in the NCAA Tournament. Win or lose, the phrase, "How about them &apos;Cats?" will be all you need to start a conversation with the Big Blue Nation locals over drinks at any of the bourbon distilleries, breweries, and restaurants in and around Lexington. Dan Dickson. When people think of Lexington, Kentucky, several things often jump to mind: bluegrass, basketball and bourbon. There&apos;s plenty of gorgeous scenery to enjoy in the greenbelt surrounding this city of 308,000 in what locals call the Horse Capital of the World. University of Kentucky basketball is a passion of the Big Blue Nation, as is the distilling of arguably the best bourbon in the world. Read the complete article in Small Market Meetings. Michele Peterson. "If you want a great horse photo, try making a mating sound," suggested my tour companion who had managed to catch the attention of Big Brown, a champion breeding stallion grazing in the paddock at Three Chimneys Farm. Read the article in Dreamscapes magazine. Megan Smith. The editor of Cake & Whiskey magazine writes a compelling love letter to Lexington on the Huffington Post. Read it here. Betsa Marsh. A horse could carry only four bushels of corn over the rough roads to the Eastern markets, but if you distilled it into liquor, the same horse could carry the equivalent of 24 bushels. Learn more about the heritage of Bourbon in this USA Today online article. Katie Van Syckle. Despite being tucked into the heart of Kentucky bluegrass country, Lexington boasts an eclectic music scene that thrives in sweaty punk bars and Irish pubs as well as local barbecue joints. Read more on Men&apos;s Journal. Zach Everson. 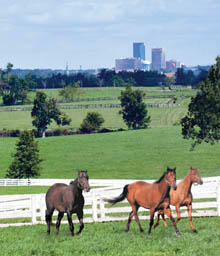 East of Louisville, through fenced-off rolling green fields where horses with a higher net worth that yours graze, lies Kentucky&apos;s Bluegrass region and Lexington, the "Horse Capital of the World." Read more of Zach&apos;s article on AOL Travel. Robin Soslow. Blue grass, roving minstrels, fiery potions, peanut-butter breezes, dancing zombies, symbol-encrusted loaves of bread: This is either a hallucination or a day in the park. Specifically, Cheapside Park, the public square in Lexington, Ky. Read this article in the Washington Post. Erin Shaw Street: Bourbon will always be king in Kentucky, but there&apos;s a new sipping trend in the Bluegrass State-craft beer. Read more from Southern Living. Katherine Nero: It&apos;s the gateway to wraparound front porches and waving at strangers.... Read more about why Katherine Nero understands that "Southern starts here". 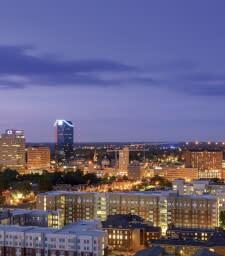 Esther Marr: Gently rolling hills carpeted in rich pastureland surround an energetic downtown. See what else Ms. Marr has to say in the August edition of US Airways. Mary Ann DeSantis: Move over, Bourbon. Kentucky wines are winning international awards as the Bluegrass State reclaims its wine-making heritage, one that began with America&apos;s first commercial vineyard in 1798. Read more at www.marysantis.com.